Organisms are constantly exposed to acute and chronic stress conditions, which challenge the maintenance of protein homeostasis. Heat Shock Proteins (HSPs) function as molecular chaperones to stabilize protein structures, facilitate refolding of misfolded proteins, and prevent uncontrolled protein aggregation. Therefore, HSPs serve as the first and last line of defense in the events of proteotoxic stresses. The stress-inducible expression of HSPs, which is a hallmark of the heat shock response, is under strict control of evolutionarily conserved transcription factors, known as Heat Shock Factors (HSFs). Invertebrates have only a single HSF, whereas the HSF family in vertebrates consists of multiple members. Direct interactions of HSFs with various proteins, including HSPs, chromatinassociated proteins, and other HSF family members as well as their complex post-translational modifications, allow these transcription factors to function not only in stress responses but also in many other biological processes. For example, mammalian HSF1, HSF2, and HSF4 are fundamental for normal organismal development and healthy aging. Moreover, recent discoveries have highlighted the importance of HSFs in tumorigenesis, neurodegeneration, and metabolic disorders, which positions them as promising therapeutic targets in multiple human diseases. In this review, we focus on recent advances in the HSF biology and discuss the functional impact of HSFs on stress responses, development, aging, and age-related pathologies. Keywords: Aging, cancer, development, HSF, post-translational modification, protein homeostasis, stress response, transcription, stress response. Keywords:Aging, cancer, development, HSF, post-translational modification, protein homeostasis, stress response, transcription, stress response. Abstract:Organisms are constantly exposed to acute and chronic stress conditions, which challenge the maintenance of protein homeostasis. Heat Shock Proteins (HSPs) function as molecular chaperones to stabilize protein structures, facilitate refolding of misfolded proteins, and prevent uncontrolled protein aggregation. Therefore, HSPs serve as the first and last line of defense in the events of proteotoxic stresses. The stress-inducible expression of HSPs, which is a hallmark of the heat shock response, is under strict control of evolutionarily conserved transcription factors, known as Heat Shock Factors (HSFs). Invertebrates have only a single HSF, whereas the HSF family in vertebrates consists of multiple members. Direct interactions of HSFs with various proteins, including HSPs, chromatinassociated proteins, and other HSF family members as well as their complex post-translational modifications, allow these transcription factors to function not only in stress responses but also in many other biological processes. For example, mammalian HSF1, HSF2, and HSF4 are fundamental for normal organismal development and healthy aging. Moreover, recent discoveries have highlighted the importance of HSFs in tumorigenesis, neurodegeneration, and metabolic disorders, which positions them as promising therapeutic targets in multiple human diseases. 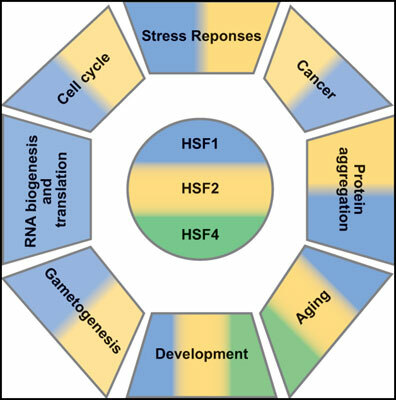 In this review, we focus on recent advances in the HSF biology and discuss the functional impact of HSFs on stress responses, development, aging, and age-related pathologies.